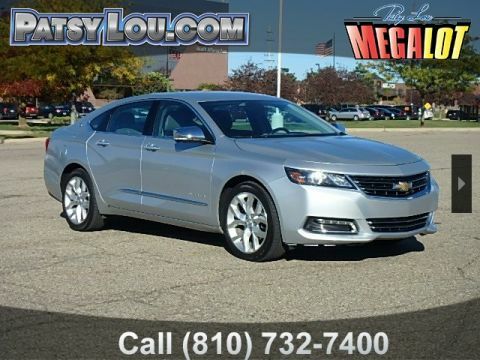 Out of the many sedans for sale in Flint, MI, the 2017 Chevy Impala Premier trim distinguishes itself for its powerful performance and spacious, sophisticated styling at a price that will impress you. A 3.6L V6 engine develops an impressive 305-hp to help you rule the road. Leather-appointed seating offers power-adjustments and heating so that you’re always comfortable. Keyless Access and Push Button Start lets you get in and go even quicker every morning! And there’s so much more to meet at Patsy Lou Chevrolet today! 2017 Chevrolet Impala Premier 2LZ CARFAX One-Owner. Clean CARFAX. V6, Impala Premier 2LZ. Priced below KBB Fair Purchase Price! Odometer is 3770 miles below market average! PATSY LOU BUICK GMC/ MEGA LOT 810-732-7500. There’s only one way to know which of our many sedans for sale is right for you. Visit us today to experience the deluxe experience of driving a 2017 Chevy Impala Premier. Our priority is your satisfaction, which is why our friendly and knowledgeable sales staff is prepared to help you find and finance the vehicle of your dreams today. Work with our in-house finance staff to get a competitive rate on a car loan and browse our vast inventory of new and pre-owned Chevrolet vehicles when you visit our showroom. We’re located at 5135 Corunna Rd in Flint, MI. You can also give us a call at 810-600-3330 to make an appointment, or leave a message online to have a sales specialist contact you with more information about this vehicle or any other vehicle in our inventory today.